With micro-cut shredders offering up to 10 times smaller particle sizes than standard cross-cuts, this Fellowes Powershred 46Ms Micro-Cut Shredder provides great security for your office shredding. It will shred up to 12 sheets of 70gsm paper at a time into very small pieces measuring just 2 x 14mm. This gives it a P-5 security level rating, making it ideal for highly confidential and secret document shredding. The shredder is built for heavy use and can run continuously for up to 15 minutes, after which it requires a 25 minute cool down period. Fellowes recommend it for offices with 3 - 5 users. If you have a requirement to shred credit cards and CDs/DVDs, then the Fellowes 46Ms also has you covered as it has a separate slot to shred both of these types of media. In addition, it can handle stapled documents so no need to remove staples before shredding, a great time saver. Bin size is an ample 30 litres and the waste bin also has a see-through window so you know when it’s getting full. To empty, the bin simply pulls out. The shredder also comes with a range of useful features. SafeSense stops the shredder when hands touch the paper entry, good for safety in the workplace. 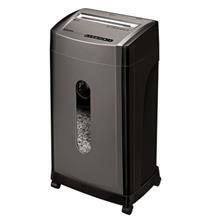 SilentShred minimises the noise the shredder makes, great for less disruption in shared work spaces. Sleep Mode switches the shredder into standby after 2 minutes of inactivity, ideal for saving power. Auto Reverse stops and reverses the shredder if a paper jam occurs. LED indicators show overheat, bin full and whether paper should be removed from the shredder. Paper entry width is 220mm for A4 shredding and the shredder has a reverse option to help clear any paper jams. Plus, the shredder also comes on castors so it can be easily moved around the office. Warranty period on the Fellowes Powershred 46Ms Micro-Cut Shredder is 2 years for the machine and 5 years for the cutters.